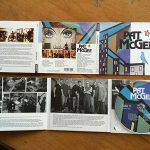 My longtime friend and former classmate at Longwood University, Pat McGee, has completed his 10th album which is released today! 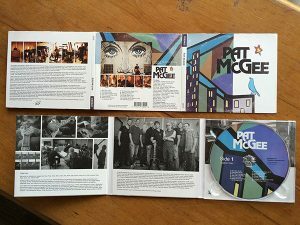 *Purchase the album here: https://itunes.apple.com/us/album/pat-mcgee/id972237400 I’m honored to collaborate with Pat McGee from an artistic standpoint on this project. Pat is using visuals from the “Eastern Rays” mural in “Bedford Hall” at Longwood University for the cover, packaging, and design of his new album. A few color alterations and a “distressed feel” have been added to the original mural images to bring the classic 70’s flavor into the design. The new album is being printed on vinyl as well as digitally. Pat recorded with his dream musicians, Artists that were on some of the most classic albums of all time. The band of legends includes: on drums- Russ Kunkel, on bass-Leland Sklar, on guitars- Waddy Wachtel, Jeff Pevar & Danny Kortchmar. There are also some amazing special guests including Pat Monahan from Train, John Popper from Blues Traveler, Paul Barrere from Little Feat and more, as well as Pat’s long time band members. This album is a return to Pat’s songwriting routes heavily influenced by 1970’s singer-songwriter/classic rock genre.